Robert Koopman, the chief economist at the World Trade Organization (WTO), joins Senior Fellow David Dollar to discuss the role global value chains play in world trade and the effects they have on developing economies, advanced economies, and the WTO. Their conversation draws from a new report published by the WTO and its partners which summarizes research on global value chains and the implications of emerging technologies. Amanda Sloat, the Robert Bosch Senior Fellow in the Center on the United States and Europe, joins host David Dollar to give an update on Brexit. She explains why Brexit did not occur as originally expected on March 29; what the process for UK Prime Minister Theresa May, Parliament, and the EU looks like going forward; and important issues such as the Irish border, the UK's potential for pursuing an independent trade policy, the "Norway model," implications of a "no-deal" Brexit, and the possibility of a second referendum. Ernesto Zedillo, former president of Mexico and now director of the Yale Center for the Study of Globalization, talks with David Dollar about the importance of globalization for developing countries, the erosion of multilateralism, NAFTA and its proposed replacement—the USMCA—and other issues on trade. Dollar also asks Zedillo whether President Trump’s push to build a border wall between the U.S. and Mexico is damaging the bilateral relationship. Wendy Cutler, vice president of The Asia Society Policy Institute and former acting deputy U.S. trade representative, joins David Dollar to discuss the structural issues in the U.S.-China trade negotiations and how a trade agreement between the two countries could be enforced. Cutler and Dollar explain the enforcement mechanisms at the administration’s disposal, the issues of intellectual property rights and state enterprises, and much more. In a special episode of Dollar and Sense, David Dollar provides an update on the current state of U.S.-China trade negotiations. He explains why the March 1 deadline to reach a trade deal has been pushed back, what a potential agreement could look like, and how an agreement—once one is made—could be enforced. Senior Fellow David Dollar talks with Representative Rick Larsen (D-Wash.) about a range of trade issues on the 116th Congress's plate, including the U.S.-China trade war, the Trans-Pacific Partnership, trade with Japan, and the new NAFTA. Congressman Larsen represents Washington State's 2nd District, serves on the House Transportation and Infrastructure Committee and the House Armed Services Committee, and is co-chair of the bipartisan U.S.-China Working Group. In this episode, Senior Fellow David Dollar and Nonresident Senior Fellow Douglas A. Rediker discuss the global economic conditions that will be on the minds of leaders assembled at the World Economic Forum in Davos, Switzerland. Rediker and Dollar cover the ongoing trade dispute between the U.S. and China, selection of the next World Bank president, the International Monetary Fund and World Trade Organization, and generalized uncertainties about the global economy. Senior Fellow David Dollar speaks with Brad Setser, the Steven A. Tananbaum senior fellow for international economics at the Council on Foreign Relations, about a range of trade topics, including currency issues, U.S.-China trade tensions, whether President Trump’s tariffs could affect manufacturing, and the proposed U.S.-Mexico-Canada trade agreement (USMCA). On December 30, the Trans-Pacific Partnership trade agreement among 11 Asia-Pacific nations comes into effect. The United States was part of the original agreement, but the Trump administration pulled out of the trading bloc. David Dollar talks with Mireya Solís, director of the Center for East Asia Policy Studies at the Brookings Institution, about the TPP, its effects on tariffs, its provisions on e-commerce, and Japan's role in keeping the agreement alive after the U.S. departed. Discussion also focused on China's relationship from the outside to the pact, the WTO, state-owned enterprises, and how other nations—including the U.S.—could join. Brookings Institution Senior Fellow David Dollar speaks with Elaine Kamarck, senior fellow in Governance Studies at Brookings, about the role trade issues played in the 2018 midterm elections, and what trade matters are likely to come up for the new Congress, such as tariffs and the auto industry. Also, Dollar and Kamarck look ahead to how trade might impact the 2020 presidential race for both parties. 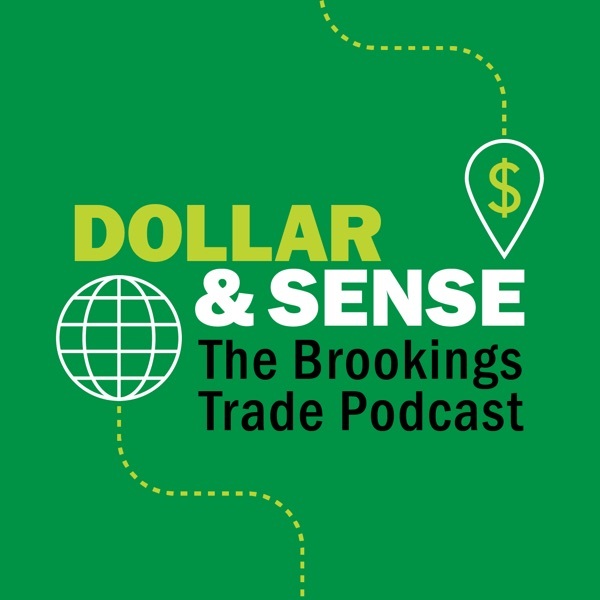 In this first episode of the new Brookings trade podcast Dollar & Sense, Senior Fellow David Dollar speaks with Senior Fellow Eswar Prasad, the Tolani Senior Professor of Trade Policy at Cornell University and a leading expert on the Chinese economy, about a range of issues in the U.S.-China relationship. The conversation includes topics such as U.S. and Chinese trade practices, bilateral trade balances, China's economy and currency, the U.S.-China trade war, and whether Presidents Trump and Xi can make a deal at their meeting during the G-20 summit in Buenos Aires. Dollar & Sense is a podcast about all things trade. From local ports and markets to international trade and diplomacy, Brookings Institution Senior Fellow David Dollar and guests explain how our global trading system is built and its effect on our everyday lives.